The main purpose of this book is to give a description of the Cholón language as represented in the Arte de la lengua cholona (ALC), a colonial grammar written in 1748 by a Franciscan friar, named Pedro de la Mata. The ALC is kept in the British Library in London. Nowadays, the Cholón language is probably extinct. It was spoken in North Peru in the valley of the Huallaga river. Cholón formed a small language family together with the neighbouring language HÌbito. 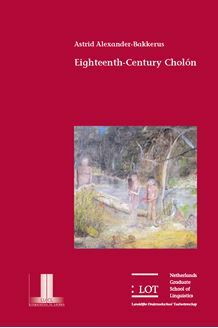 The description of eighteenth-century Cholón, the linguistic part of the book, is preceded by a description of secondary sources and of theories about genetic relations (chapter 1), by an ethnohistorical sketch (chapter 2), and by an analysis of the manuscript (chapter 3). The linguistic part starts with an analysis of the orthography used in the ALC and of the observations about certain sounds, in order to reconstruct a tentative sound system (chapter 4). Chapter 5 deals with morphonology. In this chapter attention is paid to syllable structure, to phenomena like vowel suppression and harmonization, and to stem-initial consonant changes. Nominal and verbal morphosyntax are discussed in chapters 6 and 7, respectively. Cholón is an agglutinative language. Besides nouns and verbs, which are the most important word categories, Cholón has a small class of adverbs (chapter 8) and interjections (chapter 9). In chapter 10 discourse markers, such as question and exclamation markers, are treated. Chapter 11 is dedicated to the negation. In chapter 12, a survey of the different subordinate clauses is given. The linguistic part ends with a lexicon.